All the massive coils of ivy you see snaking along the walls belong to one single fig ivy plant. 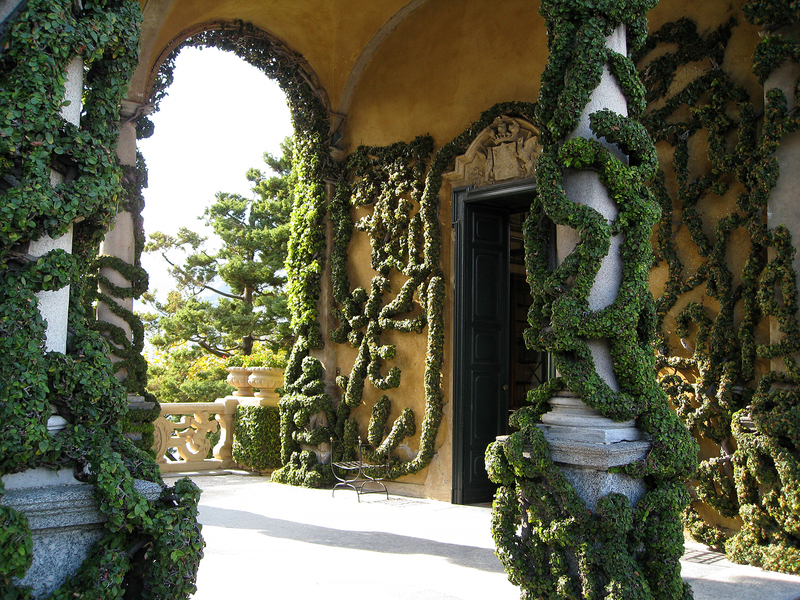 This is the veranda of Villa Balbianello. The villa overlooks Lake Como on the tip of a small wooded peninsula on the western shore, and this portion, the loggia, was built by Cardinal Angelo Maria Durini around 1790. It’s been said this loggia is where coffee was served for the first time in Italy. I joined The Institute of Classical Architecture & Classical America in September of 2007 on a two week tour of the Northern Italian Lakes, where we visited numerous villas and gardens. I could not pass up this experience knowing that a lot of these places are not usually open to tourists and that seeing all of them as an individual tourist would be next to impossible. This was the chance of a lifetime. The lakes we visited were first Lake Maggiore, then Lake Orta, third was Lake Como, fourth was Lake Lugano, and the last stop was Lake Garda. I’m not posting this for its view and history. I want you to notice those huge snaking coils of fig ivy all of which belong to one single plant. Just one. I don’t know how many years it took to train it to its current shape. Speaking of snakes, the Visconti family owned this villa at one time, and their emblem/crest, which is carved onto the stone balustrades, shows a huge snake devouring a child. How they came up with that design is a mystery to me. Perhaps the Viscontis are responsible for training the fig ivy into its current serpent shape. But probably not. (above) The gardens of Villa San Remigio on Lake Maggiore. 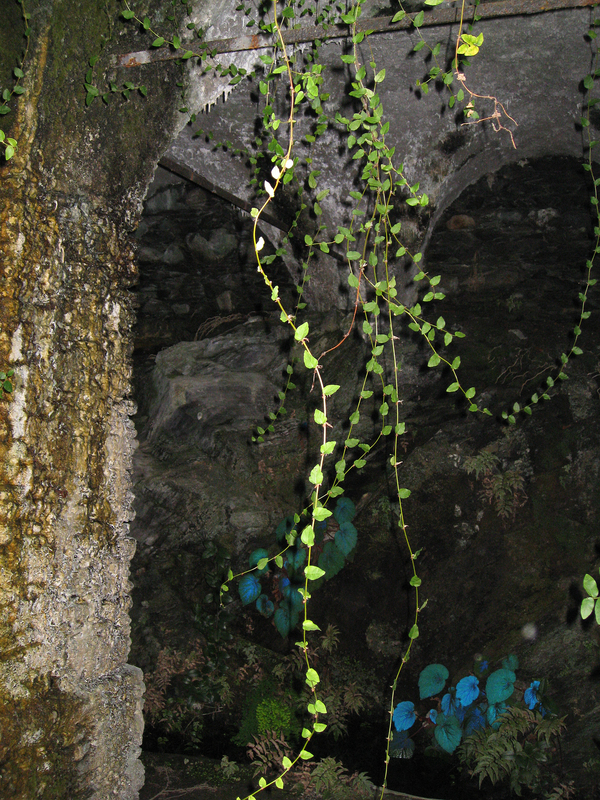 I found these fig ivy streamers in a limonaia with a grotto containing a stream in one of the villa’s many numerous gardens, the Garden of the Hours. It’s amazing what kind of exotic plants can thrive in such deep shade. The pictured iridescent blue leaf belongs to some kind of begonia. 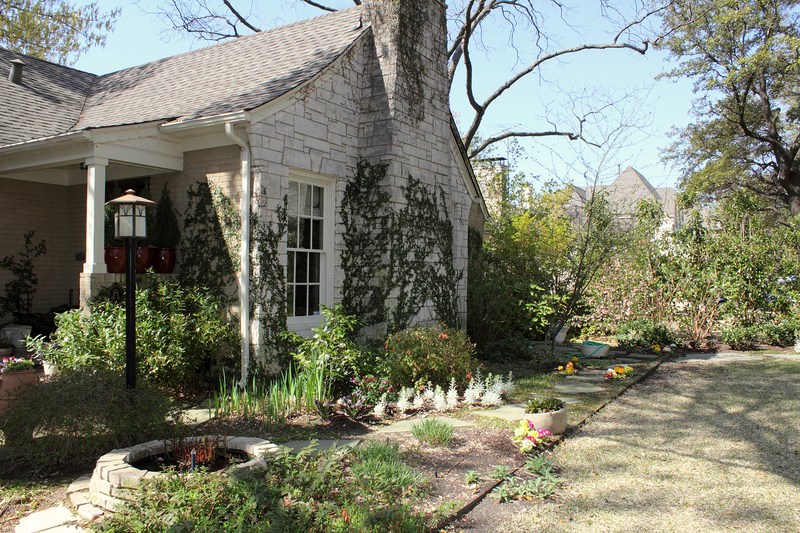 (above) This is my house, and as you can see in this photo, by the end of each summer (photo taken in August 2009) the fig ivy has swallowed up my house in a dense carpet. It would wrap up my house completely if I allowed it to. 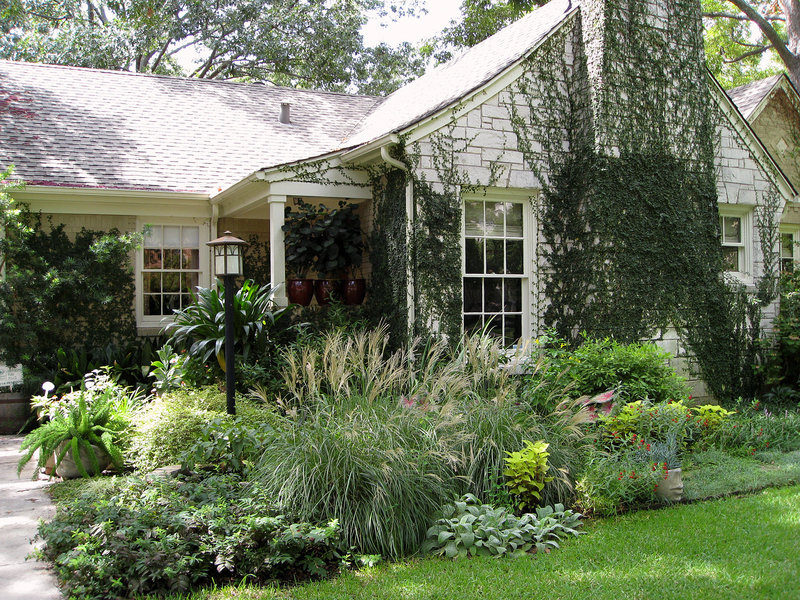 (above) Every year in late February or early March I trim it back and thin it out creating a kind of lacy pattern. I’m a fraidy cat when it comes to stripping the cut vines off the top third of my chimney. So as you can see, I am not training my multiple vines into some fantastical snake pattern. And no… I did not run into George Clooney at Lake Como.